I was absolutely delighted to be asked back for my 5th year assisting with judging for the FreeFrom Skincare Awards. Blogging isn't my career so I get in early with holiday forms and book the day off from work. Not only is it a fun day hanging out with everyone but I also learn so much and as part of the process I get to slather myself in lots of products (although we are not judging on performance at this stage but perks of the job!). I always have my eye out for skincare that meets my high standards and requirements as a consumer with multiple allergies and skin issues. This year almost 200 products from more than 100 brands have made the shortlist. Five brands lead the way with four shortlisted products each – AA Skincare, Bloomtown Botanicals, Feisc, Gaia and Neantog (The Irish Nettle Company). The shortlist follows a period of intensive testing of all entries by a 90-strong team of dedicated Ultimate Natural Beauty Bible and Skins Matter testers, each with sensitive or problem skin, or with a keen passion for natural and ‘free from’ skincare. I'm of the opinion this is a very tough award so everyone who gets to this stage should be very proud of their achievements. We scrutinise every product for ingredients and labelling. Alex's article on some of the issues we faced this year makes for interesting reading - Testing and judging at the FreeFrom Skincare Awards 2017. I'm often disappointed when you see fantastic feedback for a product but the brand lets themselves down on labelling. I've mentioned many times about the importance of cosmetic regulations for INCI, fragrance allergens and marketing an eczema cream with borderline medical claims but still people are making mistakes. This year’s Awards are supported by sponsors NATorigin (Family Skincare category), Beauty Kitchen (Men’s Grooming), Bare & Beyond (Face Care (Leave On)) and Green People (Lip Balms). 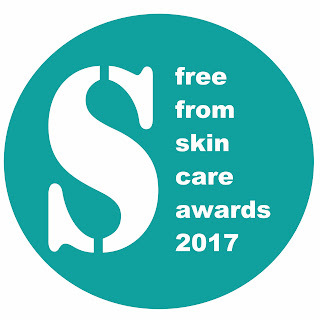 Winners and runners-up in all 14 categories – plus additional awards for Best FreeFrom Skincare Brand, Best FreeFrom Achievement, and of course Best Overall FreeFrom Skincare Product – will be announced at a presentation at the Love Natural, Love You show at Olympia on 7th July 2017, with special guest Janey Lee Grace. just a small selection of entrants to the awards! "Half the brands on the Shortlist are first-time entrants to the Awards, and many are new and small start-ups,” says Kirsty Mawhinney, Awards Administrator. “This reflects the degree to which ‘free from’ and natural skincare is constantly growing and improving." "It’s great to see this sustained growth,” adds Alex Gazzola, Awards Co-ordinator. “These products are invaluable to consumers with allergies, problem skin conditions, religious sensibilities and ethical or environmental concerns. The judges have had a tough time deciding on winners!" The Shortlist can be viewed at the Free From Skincare Awards site. I look forward to seeing you all at the awards ceremony in July. Thank you for the blog post and yes wonderful to have so many new brands enter 2017. I know that the judging day inspired you to go out and buy a few of the products. This is exactly why brands should enter awards is to raise their brand profile and messaging. Wishing you well over the summer.